Fractography of failed component Fractography of failed component Fractograph showing multiple crack nucleation sites from fretting-induced microcracks; growth of semi-elliptical cracks from surface; dominant fatigue crack growth of the corner crack; and overload fracture. 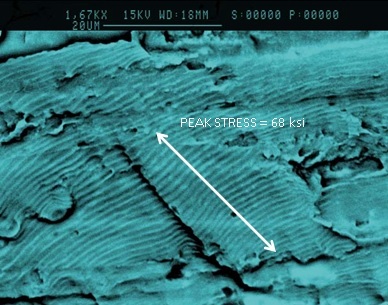 SEM Image of Fatigue Striations on Failed Component. Component failures in the field are costly, so determining the cause quickly and efficiently can save millions in lost revenues and man-hours. Lambda uses state of the art equipment and advanced modeling techniques to provide comprehensive failure analysis. Our technicians can establish the failure mechanism, calculate the stresses at failure, and provide a complete history of crack growth in your component. Historically, fractography has been used as a post-mortem analysis of failed components and structures. In most cases of fatigue cracking, stress corrosion cracking, and overload failure, conclusions as to the nature of the failure are based on qualitative analysis of failed parts, and recommendations are made to rectify the problem. In some instances, a more detailed quantitative fractographic analysis may be in order. 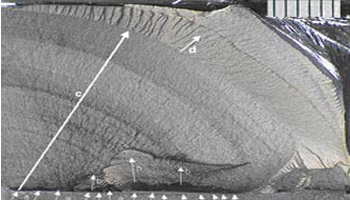 Quantitative analysis of a failure may be performed with the assistance of linear elastic fracture mechanics (LEFM), knowledge of the fatigue crack growth behavior, knowledge of damage processes like SCC and creep crack growth, and any other available evidence. By using quantitative fractographic analysis, a detailed chronological account of a component’s service history with loads and cycles can be extracted. High Cycle Fatigue (HCF) is one of the most common failure modes of critical components. The cause of component failure must be quickly and accurately assessed in order to determine a solution. The actual stress at the failure site is often unknown since the components are designed to operate well below the fatigue limit. By performing detailed examination of the fatigue striations and applying fracture mechanics theory, Lambda provides the expertise and tools to accurately assess the stresses at the failure location. Lambda utilizes SEM imaging of the fracture face and advanced analysis software to determine the stresses that cause fatigue failures. Lambda can conduct the analysis on a replica of the fracture face eliminating the need to have access to sensitive hardware. Using this novel technique, Lambda can quickly provide information our customers require to solve their critical issues.